Robert Logan Cassedy, 79, of Fayetteville, passed away on August 10, 2017. He was born in Jacksonville, FL on October 28, 1937 to the late Charles and Carrie Cassedy. 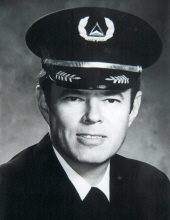 He was a retired pilot with Delta Air Lines with 37 years of service. Robert is survived by his wife of 48 years, Phyllis Clark Cassedy; his sister and brother-in-law, Nancy and Charles Turner of Orange Park, FL; his nephews, Todd and Kathryn Turner of Phoenix, AZ and Chuck Turner of Gainesville, FL; his sister-in-law, Gerry Clark Lindequist of Manlius, NY; his niece, Laura and Mehul Malik and grand-niece, Lila Malik of Vienna, Austria; and his nephew, Thomas Lindequist of Syracuse, NY. A Graveside Service will be held at 1:00 PM on Wednesday, August 16, 2017 at Westview Cemetery, 1680 Westview Drive, Atlanta, GA, with Dr. J. W. Wallis officiating. The family will receive friends from 5:00-7:00 PM on Tuesday evening, August 15, 2017 at Mowell Funeral Home, Fayetteville. The family would like for everyone to join them at Prime Events at 240 N. Jeff Davis Drive, Fayetteville following the visitation to reminisce and celebrate the life of Bob. In lieu of flowers, the family requests donations in Robert’s memory to Southwest Christian Care, http://www.swchristiancare.org/. To send flowers or a remembrance gift to the family of Robert Logan Cassedy, please visit our Tribute Store. "Email Address" would like to share the life celebration of Robert Logan Cassedy. Click on the "link" to go to share a favorite memory or leave a condolence message for the family.